Your Eye for Design (EFD) hair extensions are a valuable accessory to your look and really easy to maintain. All you need to know is follow the basic care instructions as outlined below. Before the shampooing process takes place it is imperative to remove any tangles present with extreme care utilizing a paddle brush. If the hair is excessively tangled, spray on de-tangler/conditioner. Do not use force or like your own hair you will experience breakage. Your Human Hair Extensions over time will accumulate residue just like your own hair. This does not mean however that you need to wash your hair extensions every day. To keep your extension set in optimal condition, it is best to wash the hair as little as possible. The rule of thumb with clip in hair extensions is to wash the hair when you notice your hair extensions have lost their sheen. It may have become dirty from the natural oils released from the scalp or excessive use of styling products such as hair spray. Obviously if your hair has spent an evening at the night club, there’s the other reason to give them a good wash – removal of odors. 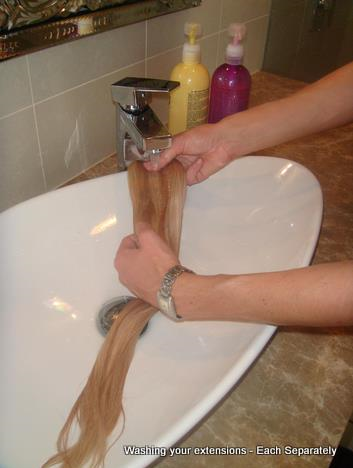 After brushing out the tangles, carefully rinse your hair extensions SEPARATELY with lukewarm water. Place a small amount of deep moisturizing shampoo specifically formulated for chemically treated hair (your extensions were colored) in the palm of your hand. The shampoo should be applied to the hair in a downward motion from the top of the extensions to the ends. Under no circumstance should you twist, rub or scrub your hair extensions, this will cause them tangle, rip or even matt. Gently lather shampoo until hair is visibly clean, then rinse the hair thoroughly under lukewarm water until all shampoo has been completely removed. Be thorough in the rinsing process as improper rinsing may result in damage of the hair. 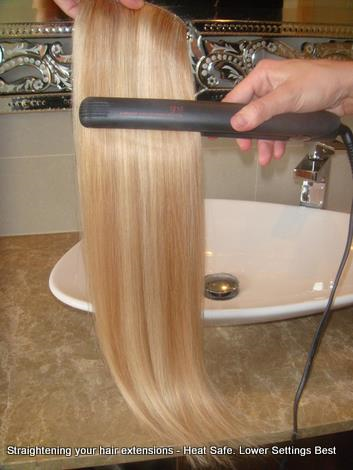 Carefully rinse hair extensions with lukewarm water SEPARATELY and wash with a moisturizing shampoo. Do not rub or twist the hair. Gently squeeze out the excess water and pat dry with a towel. Allow the hair to dry naturally until ‘bone dry’. Do not use the hair dryer to blow the hair and the extensions will return to their original curly state. It is imperative that you condition your 100% human hair extensions to maintain its softness and shine. Again a small amount of conditioner should be applied as before using a downward motion, refraining from twisting, rubbing or scrubbing the hair. We would recommend you leave the conditioner on for up to 5 minutes then rinse thoroughly with lukewarm water. Gently blot hair with towel to remove excess water. After rinsing and towel blotting (drying) the hair, it is advisable to spray the hair with a leave-in conditioner before attempting to remove any possible tangles with a wide tooth comb. Starting at the ends of the hair, comb the hair carefully to remove any existing tangles. Move in a downward motion away from the clips towards the ends. Continue this method until all the hair is tangle free. You want to create the least amount of tension that may result in hair breaking or pulling from the weft. 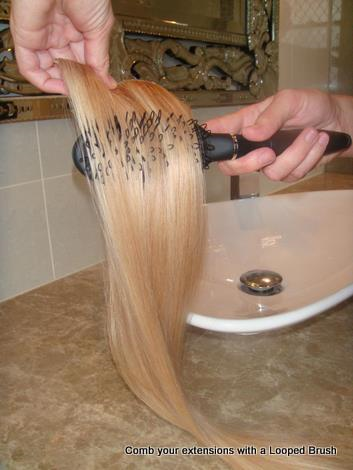 Do not use bristle brushes or fine tooth combs on the hair extensions. We recommend you use the Looped or Paddle Brush to minimize breakage. Then lay them down on a towel to dry naturally without heat. Your 100% Remy Human Hair Extensions will last longer this way. There are a million and one ways to style and groom these fabulous 100% human hair extensions! The possibilities are endless with so many colors and lengths to choose from. Whether you have purchased the straight or curly extensions you can now enjoy longer, thicker hair that will instantly transform your look. The results are fantastic. Eye for Design Human Hair Extensions are versatile enough to be colored, blow dried, hot ironed or permed by an experienced stylist to suit your individual needs. But remember just like your own natural hair, heat is the enemy, but doing this every once in a while is okay. Blow dryers, curling irons and other thermal tools may be used on LOW settings. Hot rollers are a great alternative to achieve a more voluptuous curl. It is important to remember that Eye for Design Clip-In Hair Extensions are made of the finest Remy-Grade 100% Human Hair and may be easily damaged if the heat setting is too high. The best way is to treat your extensions as if they were the hair on your own head! It is best to store your hair extensions in the bag that it came in, do not seal the bag shut. You can air them out instead of over washing them. Spray a little perfume or deodorizer. However, you can store the hair any place at room temperature in a safe place out of reach of children and pets. Do not swim or sleep while wearing hair extensions.